Of course the million dollar question for any winter sportsmen and women coming to Zakopane is: "is it snowing?" There are also artificial snow makers to bolster Zakopane's snow conditions if Mother Nature isn't supplying the goods. In the very near future Zakopane Life plan to bring you an up-to-date prognosis on the exact snow conditions on the slopes but for now please check our standard weather page to see if the white stuff is falling! Hi Is it still snowing? And can I still skii? It's still snowing. Not as much and there's also more moisture now but there's also been alot of snow this year so it will take a while to melt completely. There are plenty of gorgeous places you can still ski in the tatras, from natural sport ski & cross country routes to natural paths in ski resorts and even some prolonging the season with artificial snow when the real stuff has melted. I visited zakopane in November 2016 it was white and had very deep snow. It was beautiful and amazing . Will there be snow on the 26th December? We'll be skiing at Szymoszkowa ski centre and we're hoping there's artificial snow machines if not, thanks! Hi what will conditions be like first week February ? Will snow be widespread? we would like to come to Zakopane 8 April /2017 do you think there will be ski conditions? Hi we will be in krakow from the 23 december and will come to zakopane from the 26 december till the 28 would we be able to ski ? We have just booked a family holiday for beginning of december thinking we were going to find snow seeing we come from an island with very hot weather, but i am a bit dissapointed cause someone just told me that we would not find snow in december in Zakopane. Is this true? A group of us are considering going to the nosal ski school from 15th December. I hear there are snow machines there. Will we be guaranteed to be able to ski at this time in nosal? We are beginners. Can you advise if there are any online maps showing where the various ski lifts are located? Hello is kasprowy wierch opened yet? Is the skiing still good in zakopane and the nearby areas? Hi. We have booked to be in Zakopane for 5 nights over Christmas (Dec 22-27). Will we definitely by able to ski? Are the slopes open now? If not, we may cancel our holiday! Thanks. Hello, what are the snow conditions like at the moment? What are the chances of being able to ski just after Christmas? Hi! I'm going to Zakopane next week. I'm not planning to go skiing but as I've never seen snow in my life I'd like at least to see it during my stay over there. Is likely to see the mountains covered in white or something like that? Thank you! hi, does it mean that if I'm going this weekend, I would not be able to go snowboarding? Hi! We have thougt with my friends to come to ski to Zakopane early January (5-12.1.2013), but do you have enough snow, when the ski season starts and how many slopes you usually have open in the beginnin of january. Hi, for your information, it has fallen downhill in Zakopane city between 10-20 cm of fresh snow in less than 24 hours(so more on top hills and mountains peak).So, it seems that in the next days it will be possible to ski on most slopes(also down hill slopes) in very good snow conditions, even if some windstorm may occur.Have some nice ski rides in and around Zakopane!Staff of Ogrodygorskie and Apart-center apartments in Zakopane. We are coming to Bialka on 31st March, I see the weather has warmed up - do you think we will still be able to ski? Hello, there is still a lot of snow on all slopes in and around Zakopane.However weather forecasts give a big increase on temperatures in next few days.The weather will be beautiful but snow will melt quickly.So, the small and low slopes will suffer quicker of that higher temperatures combined with strong sun than the High level resorts like Kasprowy Wierch.Hope it helps. Hello, There is still a lot of snow on all slopes of Zakopane, so it should be very good ski conditions next week for your holidays in zakopane. Hey there, we are arriving in zakopane on the 27th of january, but it seems like the weather forecast is bad? Temperatures above zero? Since the forecast on your site is the one for krakow, can you give us an idea of what we can expect when we want to go snowboarding? Hello! I am hoping to come to Zakopane in February 2012 - have you got any tips on what the ski conditions might be like at this time of year? Thank you! Hi - we are planning to arrive in Poland in early December, but more specifically in Zakopane on the 15th. We will be staying in the town centre, booked in for 4 nights. I do have one question though - will the ski slopes be open? Many thanks from Wisconsin! Other sites are reporting ski season over. Is this true? We are arriving on the 10th April so should we leave our ski stuff at home?? Hello , the SPRING arrived in Zakopane.At the moment it is sunny often but warmer (+5-10 Celsius by day-0-5 by night).So,the snow on slopes are getting melted slowly.However you may have a chance to ski on few slopes with not very good ski conditions , otherwise you may do some trekking and sightseeing to discover the city with amenities, museums, aquaprk and spa center...You can check by yourself: SKI SLOPES MAPS http://www.narty.l.pl/wyciagi_tatry.htm WEBCAMS ON ZAKOPANE SLOPES http://www.narty.pl/kamery/polska/ WEATHER AND SNOW CONDITIONS ON SLOPES: http://www.narty.pl/prognoza-pogody/polska/zakopane/ The best time to come to Zakopane for skiing in good conditions is from January to end of February(middle of march sometimes, end of march rarely).Welcome Back to Zakopane anyway in a near future for skiing or trekking. Can anyone tell me what the snow conditions are like at the moment? We are due there in two weeks and praying to ski!! Although the sun is shining, the temperatur is around -4/5 which means what snow fell is still around. At Nosal the skiing is good! Some report that fresh snow is due early this week. Depending on favorable snowfall, temperature, quality of snow on the slopes, most slopes will be opened from very early to late night as it is a holiday period/peak time and all ski professionals will do their best to maximise the quality of their slopes to welcome the maximum of tourists coming to ski. We don't want to reserve any. The question is maybe some local stuff can comment here, if all slopes will be available? Unless you pay a big sum of money, there will be no chance for you to reserve lifts and slopes only for you. we've plans to ski in Zakopane on February 4-7. As I know, there are national children holidays in this time, and due to this, tracks can be overcrowded. Even some lifts can be reserved. Please comment if it is true. There may be a chance that there will be some snow and still good ski conditions on some slopes.But all depends on the Zakopane Foehn ("Halny"), and a good weather forecast with some snowfalls and low temperature. we are looking to ski at the beginning of April. Will the snow still be around? Am heading to zakopane next week and was wondering if there is any decent snow left?? Also, is there a terrain park there? stefan that sounds very assuring thanks for the update, was v worried if we arrive with no snow... heading tomorrow for two weeks happy skiing! Current snow conditions: absolutely plentiful. We're in the midst of a proper Polish winter. Temps in the -20s so no need to worry about meagre snow! heading out to zakopane next week, how are the snow conditions/depth? Having spent 40 hours in snow blizards driving here from the UK. I get here for Christmas and its 13c and no snow. What the hell is happening to the world. Not daunted by the lack of snow there are loads of bars to try out and the hospitality of the people of Zakopane is the best. Been coming here for youras a a little lack of snow is not going to stop me. Spent 5 weeks in africa just recently and only had 4 full days of sun so can't complain. Thursday 19 March , can anyone tell me one the snow conditions are at the moment? 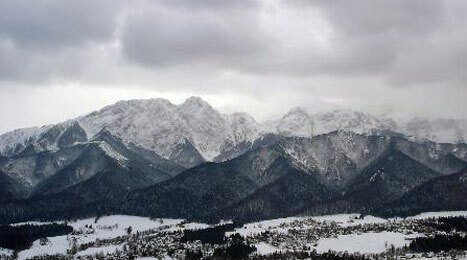 Thinking of going to Zakopane beginning April. People on trip adviser saying bad snow, keep away. Is there going to be suitable skiing for second time skiier,and mumwho skied 25 years ago, then just one week 4 years ago. blue/ green or easy red runs? Hi! How has the the snow situation usually been in december? I'm planning to go there for example a week before christmas. Hey. Just got back from a great time skiing in Zakopane. I found that looking at the webcam at http://www.szymoszkowa.pl/kamera-3.html gave a good idea of snow conditions. That piste is very low down, so if there is still snow there, you can bet there is more higher up the mountains! Hi. Well we are in zakopane right now and this afternoon it hasn;t stopped snowing... so possibly the snow conditions will get better. I too want to know the snow conditions in Zako and have just spent ages trying to get some up-to-date infoon interent. I am coming skiiing with my daugthers in 10 days and at present it doesn't look good for us! Can any one tell me otherwise? Hi, I am there at Zakopane at the moment. There are very bad snow conditions. Natural snow is there only at Kasprovy but on Polana Sym. was somehow fun too. Althou the trail condition was not good. Tomorrow will try some places outside the Zako, maybe better luck there. And then further to Slovakai.